Sales is all about overcoming obstacles to help push deals across the finish line. The worst part is, the obstacles don’t stop when the deal closes. Once the contract is signed, you still have to generate an invoice, collect payment, and make a record of that payment. The good news is we’ve released a few new things to help you tackle potential deal killers, make sure you get paid, and track those payments with little to no effort on your part. Easily update field assignments if signers change or you assigned it to the wrong person. As an official Stripe Verified partner we included Stripe payments with every plan. Connect your PandaDoc documents to QuickBooks or other accounting software with Zapier integration. In a perfect world, signing a document is an easy and hassle-free process. But often it turns into a time-consuming challenge that eats at valuable selling time. Now you can easily edit recipients and/or the signing flow for a draft before it is signed. Heads up! We will release recipient editing capabilities for sent documents too, stay tuned. You succeeded in negotiations and now it’s time to sign the contract. As luck would have it, your signer left for vacation and is out for the rest of the month. Instead of duplicating your document and sending a new version, you can simply change (re-assign) Samuel’s signature fields to Matthew. Whether we’d like to admit it or not, we’ve all been here before. You teed up the perfect proposal and sent it off to your contact, Danielle. Except, you were in a rush and typed “Daniel@company.com.” Not only did you botch her name, Danielle never received your document and now you have to create a new one (just because of a typo!). Fear not, now you can quickly edit the recipient’s contact info and Danielle will get her document before she even realizes it was missing. Sometimes different signers are responsible for different parts of the contract or proposal… and sometimes, your contact doesn’t tell you that until after you’ve prepared your document. For example, the Finance team confirms payment terms and conditions, and the Operations department has to validate the quantities and product specifications. Once you know who is responsible for signing which part, you can edit the document and reassign the fields accordingly. The “edit recipient” feature is available for all PandaDoc users. Great news! No matter what PandaDoc plan you’re on, you can enable payments and start receiving credit/debit card and ACH payments (via our Stripe integration) whenever a customer signs your doc. To enable payments collection, add the Stripe payment gateway in the Payments section of your Workspace Settings. 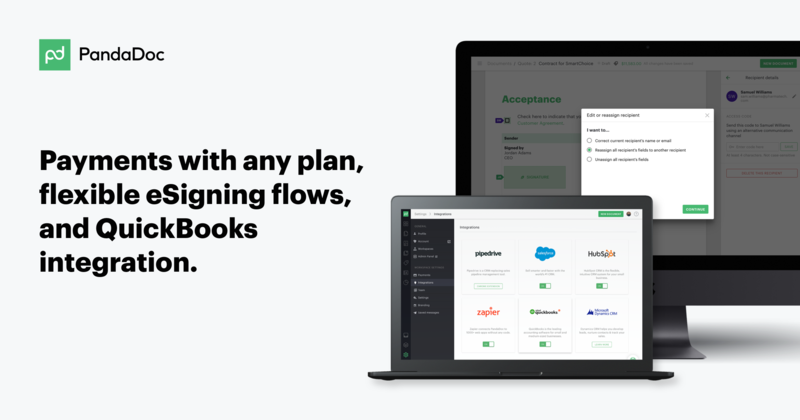 With QuickBooks connection created in Zapier, you can generate invoices on the fly from signed agreements and add new customers to your client database. Our integration works with pricing tables from PandaDoc CPQ software. When a contract or proposal is signed using PandaDoc, QuickBooks can generate an invoice automatically with the contact info and pricing information from the signed contract. The auto-generated invoice contains the list of the products, prices, quantities, and other customer data from your initial document. The heavy lifting is done – just review it and send. Get started in minutes with ready-to-use PandaDoc Zap templates for QuickBooks. Just enable the Zapier integration in your Workspace Settings and set up Zaps in your Zapier account. Test drive our September updates by logging into your PandaDoc account now or starting a free 14-day trial. Happy selling! Vik is the Head of Product at PandaDoc. He loves being a part of innovative products and ideas, passionate about finding the best product solution.